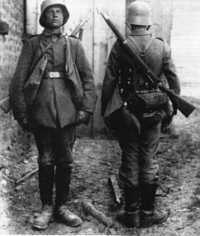 Sturmtruppen, or Stormtroopers (also known as shock troops) were first employed by General Oskar von Hutier, nephew to Ludendorff, on the eastern front in September of 1917. 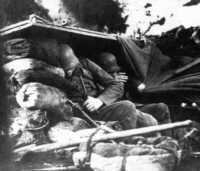 Hutier's strategy involved bringing the sturmtruppen up to the front under cover of darkness, launching a fast and powerful artillery bombardment (170 batteries supported by 200 medium and heavy mortars in this case) consisting of conventional explosives and gas. This replaced the prolonged bombardments that, in effect, warned the enemy of the coming offensive. Waves of sturmtruppen armed with the latest in weapons (flame throwers, grenade launchers, light machine guns) would then assault weak points in the enemy line in a leapfrog manner. The key to success was surprise and speed. This tactic accounted for large German gains during the late years of the war and would evolve into the blitzkrieg (lightning war) tactic of World War II. The sturmtruppen uniform - sleek, allowing for unhindered movement. A far cry from the infantry uniforms and cumbersome packs of earlier years. Stormtroopers exhibiting their weapons cache. Note the formidable array of grenades and bombs - all state-of-the-art for 1917. Sturmtruppen tactics. Note that the waves initially bypass enemy strongpoints only to come back around and attack from the rear. Moving out at dawn - sturmtruppen silhouetted against the morning sky. These troops would be brought up to the front under the cover of night so that they would not be detected by enemy reconnaissance. The surprise must be complete. Positioning newly brought-up artillery for the surprise attack. A brief, but intense, barrage of high-explosives and gas will prepare the way for the shock troops. The enemy will still be dazed by the time the first wave reaches them. Waves of stormtroopers leaving the staging trenches. 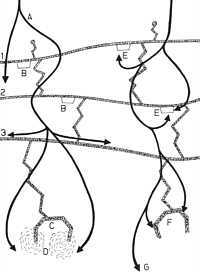 Wave after wave would leapfrog their way through weak points in the enemy defensive line. The ability to rapidly exploit breaks in the line was a basic sturmtruppen tactic. Stormtroopers taking cover from an allied artillery barrage.